In a recent issue of the Cricketer magazine there was a photograph of the Duke of Edinburgh meeting members of the teams contesting the inaugural World Cup, in June 1975. Forty or fifty players are in the picture, and it’s an enjoyable exercise to pick them out: Ian Chappell, Doug Walters and Farouk Engineer are among those easily recognised. But of the England captain Mike Denness there was no sign. In a sense it was quite apt: by this time Denness was yesterday’s man, in captaincy terms, a dead man walking. After a disastrous tour of Australia the previous winter his head was very much hovering near the block; one more Test match was to be his lot. He was of course, Scottish by birth, still the only man born north of the border to captain England, although his successor Tony Greig had Scottish parents. He was encouraged by his father, himself a keen cricketer who moved the family to Ayr, and a short distance from the local club, when Michael was seven years old. He joined straight away, and showed promise in adolescence – named Butlins’ ‘number one cricketer of the week’ at the age of 12 – and, the following year, taking all ten wickets for six runs, unlikely as it may seem – which earned him a bat and a congratulatory message from Alec Bedser. It would not be the last time their paths would cross, of course. 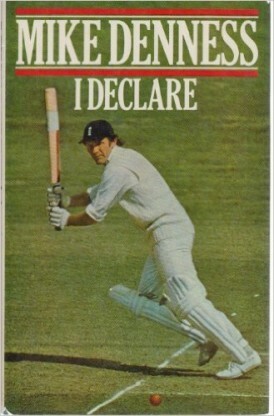 The Denness story thereafter is quite well known – after establishing himself in the Kent side he was offered the captaincy in 1971 after Colin Cowdrey’s long reign, and the following year was named vice-captain to Tony Lewis for England’s tour of England and Pakistan, despite having played just one Test at that point – against New Zealand in 1969. Lewis himself of course, had not even played once for his country. If that seems extraordinary now, and even then must have seemed like a throwback to the early Fifties,Denness is quite matter-of-fact about it, while acknowledging his good fortune. A year later the captaincy was his – not to universal approval. He led England on two tours and in one home season in 1974. There were two incidents of his captaincy that I was especially interested to read about – the notorious Greig/Kallicharran run-out in the West Indies and the occasion in Australia when he dropped himself – both are covered fully and thoughtfully. Written, I’m sure, without the benefit of a ‘ghost’ this is a slim volume compared to the doorstop memoirs of more recent stars of the game. Of course Denness’s time at the top was considerably shorter than the likes of Steve Waugh or Ricky Ponting but it was certainly eventful. It’s a pity he never updated it as it would have been interesting to hear his take on the controversial India-South Africa Test when he attracted so much opprobrium for his decisions as a match referee. In short a book worth seeking out for anyone with an interest in cricket of the Seventies, and Kent supporters of course. This book reminds me of one of the very first tour books written way back in 1871 Wickets in The West by R.A. Fitzgerald.